Have you heard that you aren't supposed to use baby powder? When my daughter was born I received baby powder as part of a gift basket at a baby shower, and was told not to use it discretely by another mom. So I looked it up, apparently the talc can cause breathing issues and seriously, is anything safe for babies anymore? Another gift I received had cornstarch based baby powder in it, so I looked that up... safe, yay! So I keep that in her diaper bag, since it has a twist top to close it. However, on her changing table... a bottle with cornstarch from my kitchen. Yes, really. It's less than half the price. 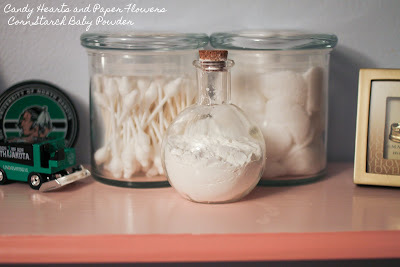 I had a round cork topped glass bottle that I wasn't using for anything else and so I just filled it with cornstarch and I just sprinkle directly out of it every diaper change. We call it "tickle powder" because as a baby she always laughed because it tickled when we put it on her. We've been very lucky and only had to deal with 2 bad rashes since she was a baby, and they are NOTHING compared to bad rashes I've seen on other kids. I really do think the corn starch has helped with drying her from the wipes and wetness before putting a new diaper on. I just sprinkle it on and then do two pats with her diaper which sort of disperses it (I hope that makes sense) and attach the tabs after the second pat. When she was a tiny baby I used to apply it with a cotton ball, which I still do when she has red bumps that I specifically want to target. On another note, I received 4 tubes of various diaper cream as gifts. The first time she had a bad rash I used diaper cream on it, after two days when it wasn't clearing up at all I just used corn starch on it to keep it dry and it was gone the next day. I haven't used diaper cream since and finally gave it all to her daycare to use up. I don't know if this will work for everyone, but it has worked well for us so I thought I'd share it.